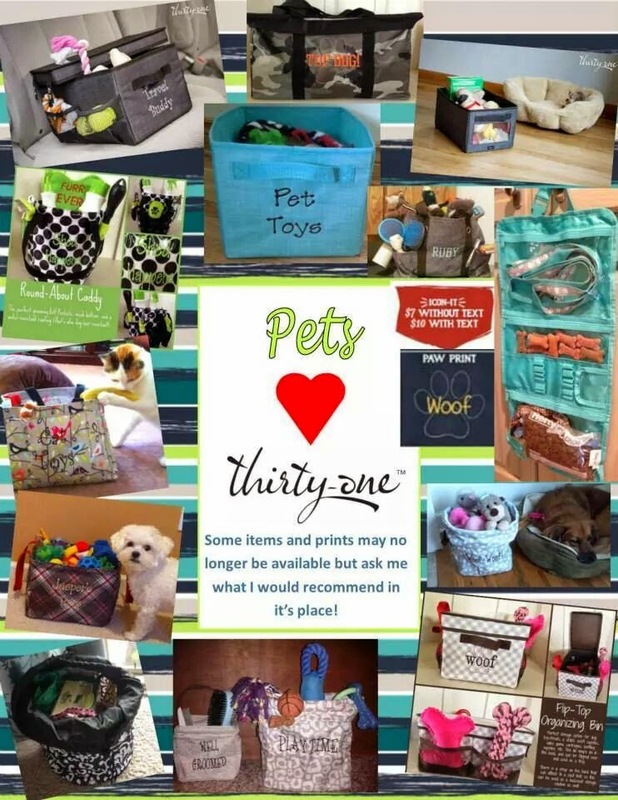 The Thirty One fundraiser is now live! Order now through October 31st. There are some great specials going on right now! Penny says, "Thank you, thank you, thank you for rescuing me! Keep scratching. I loveeee you!" I wanted to stop by and share a little story about our Otis. 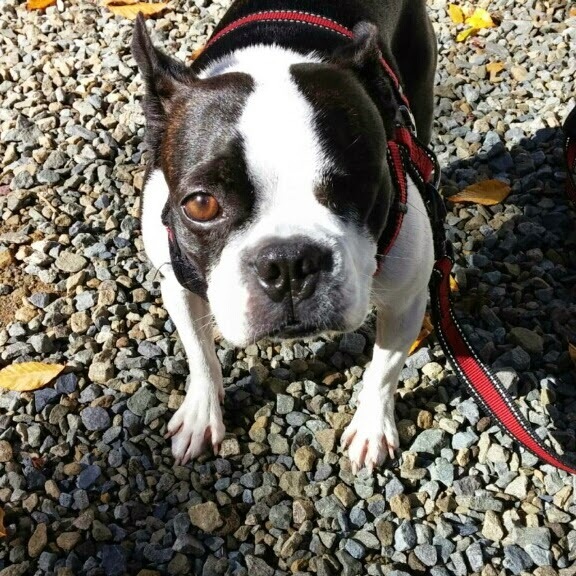 Some of you may remember him - he's a Boston mix we fostered last year. He completely stole my heart and never left. Anyway, he's a mix of Boston and "something" but regardless, they're all bully breeds and he's often referred to as a Pitbull/Pocket Pitbull. He looks very happy, and I bet you have a big smile on your face as well. 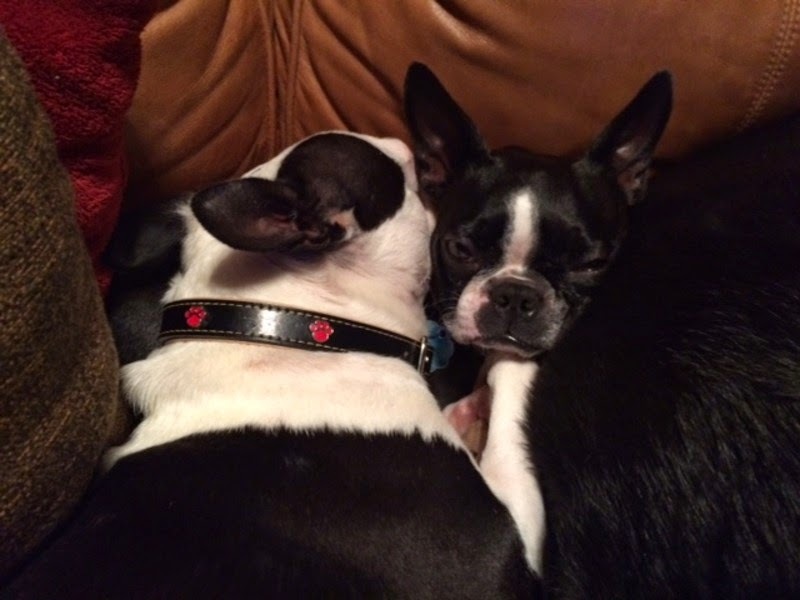 Spot and Dolly are cuddle buddies. "Becky" was surrendered to the Elizabeth NJ shelter. She is about 12 years old and just about blind. Loretta Dolan will pull her and foster her TODAY! Thank you Loretta for opening your heart and home to this beautiful, deserving girl. 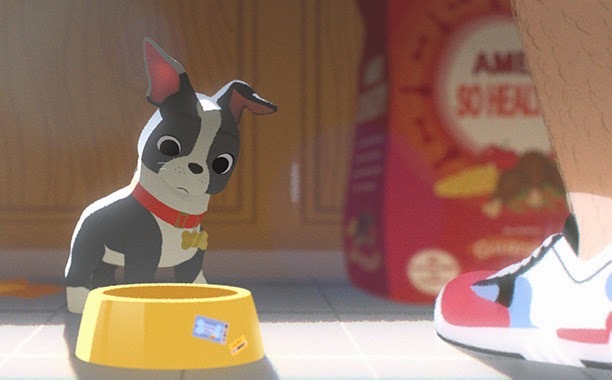 Walt Disney Animation Studiso has just released our first official look at Winston, food-loving dog and the star of their new short 'Feast'. The short, relays the story of one man’s love life is seen through the eyes of his best friend and dog, Winston, and revealed bite by bite through the meals they share. It made its world premiere at the Annecy International Animated Film Festival on June 10, 2014. 'FEAST' will play in front of Disney 'Big Hero 6' on November 7th. Delilah was able to have her spay and hernia surgery Monday and did great!! She spent the night at the vets, where the techs love her! She got lots of love from them!! She is acting normal and as if she's in no pain. Dogs amaze me! 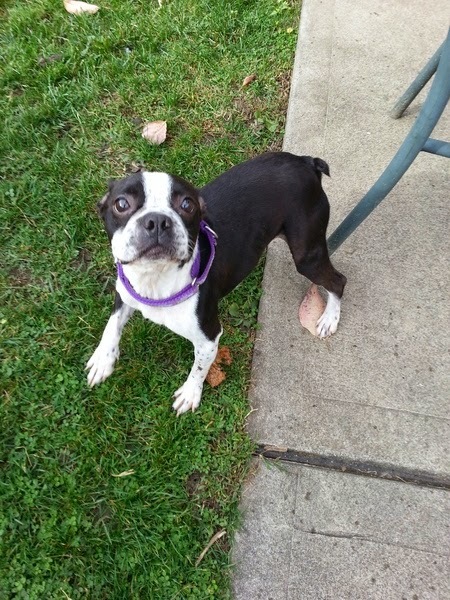 She has an adopter waiting for her to heal so they can welcome her into their home! Hank went looking for love at Petco! He got to walk around and meet people who all thought he was adorable! This guy is looking for a home so he can be the center of attention. Hank loves his walks and treats and people! Hank had a great time at Petco getting attention. He is 26 pounds and looking for a home without other dogs and small kids. This guy is really ready for a nice home to be the center of attention! He was a good boy at Petco! Everyone that met him loved him! 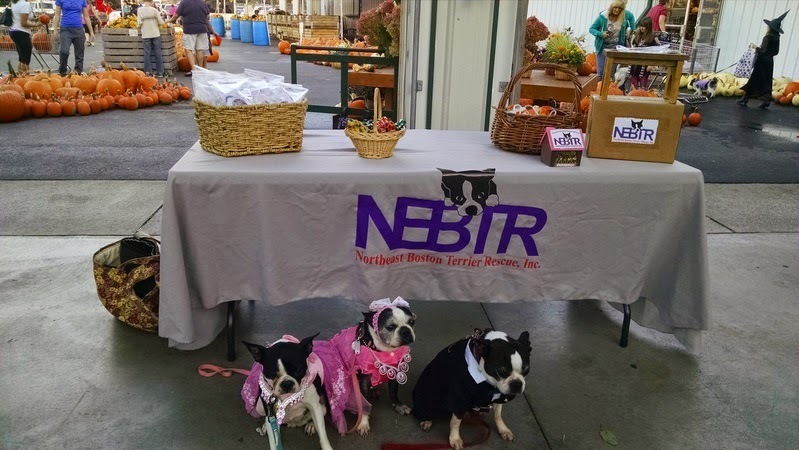 Our wonderful Betty Ann operated the NEBTR table today at The Garden Factory for Doggie Dress Up Day. I attended with my gang, well three of them anyway. We didn't win the costume contest but we had fun and had lots of folks asking about Boston's. This is me with my pups. I have also included a picture of the table and Chelsie, Duke, and Missy. We lost to four Irish wolfhounds dressed as basketball players and the referee, two English bulldogs dress as minions, and a tiny lhaso Apso dressed as a sparkly witch. We were the only Bostons there, which is a surprise. Lots of people asked about them and the rescue, so we got the word out there. Here's a photo of Baby ( foster failure) and the newest member of the NEBTR, Brutus! Oh I love it! Brutus is precious, and Baby is a beauty. Ty is recovering from his neuter, under the watchful eye of his brother, Po! I've tried many different names to get her attention, but she doesn't seem to respond any. 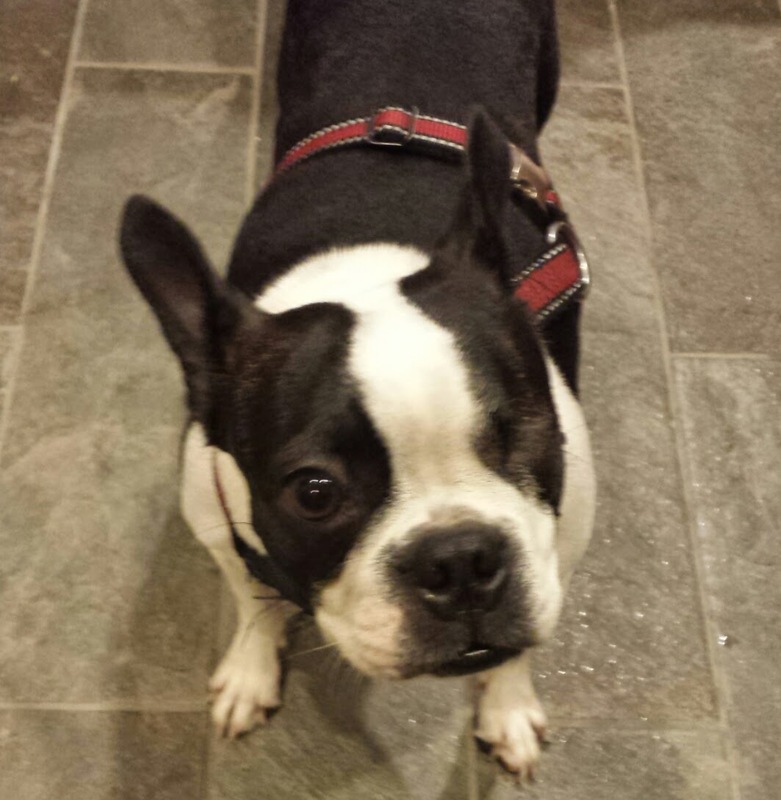 So we'll be calling her Penny - since she's lucky and only has one eye. She's been very friendly with me, my boyfriend and house guests. Gets excited when people give her attention. She loves getting her bum scratched and shakes her legs in excitement! But she also can relax and chill in her crate. So far she's been good with kids (the lady who recieved her had a 2 year old). She gets along fine with other dogs as well. Penny is going to make someone a great companion she is super friendly and just wants love. I'm excited to help her find her forever home. I've attached some pictures of Penny also one of my foster failure Coco.